I expected a lot of difficulties before moving to Asia but one thing that never occurred to me was that those difficulties would center around my hair. From language barriers and cultural differences to lack of time to keep up with it, my hair ended up in a whole lot of interesting situations. It may seem strange but here are just some of the things that I experienced while trying to keep my hair under control as I traveled around Asia. 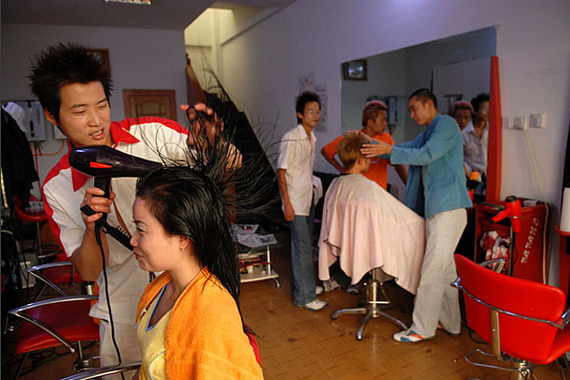 I had been putting off getting my hair cut while living in China because I just wasn't sure how to communicate with the hairdresser. After dealing with the mess that I caused while trying to trim my own hair, I decided to be brave and head over to a professional. Lucky for me, I had made friends with some of my Chinese co-workers and I had them write out a detailed note in Chinese describing what I wanted. I shuffled over to the salon and handed the note to the hairdresser as everyone in the place seemed to watch. I could tell that the staff and the customers were all talking about me in their language and it seemed like people were opting out of having to be the one to cut my hair. I sat in the chair, tried to speak some Chinese to prove I was making an effort and sat back to see what would happen. After he finished with the cut, I handed over the equivalent of $5 for the entire process and looked at a head of hair that I absolutely loved. The time had come for me to get my hair re-colored. I hadn't had it done since I left the U.S to move to Asia and it was looking pretty terrible. I was visiting Seoul for a while and it seemed to be the kind of place where I could get a quality color without worry. I researched pictures online and went to the salon armed with a gorgeous photo of Alessandra Ambrosio Balayage's hair. I showed the woman who was going to be doing the job, she nodded in approval and seemed pretty confident in her abilities to make me look like the Victoria's Secret model. I busied myself with reading magazines while she worked, freeing myself of negative thoughts concerning the outcome. What I saw when she was finished was absolutely shocking though. Instead of being brown with blonde highlights, my hair looked like something out of an early Madonna music video. There were streaks of orangey bleach amongst a sea of rust colored locks that were now adorning my head. I tried not to cry, paid her the fee and went back to my hotel room to reevaluate my life. On a trip to Japan, I decided to do some shopping around the souvenir stands of Kyoto. 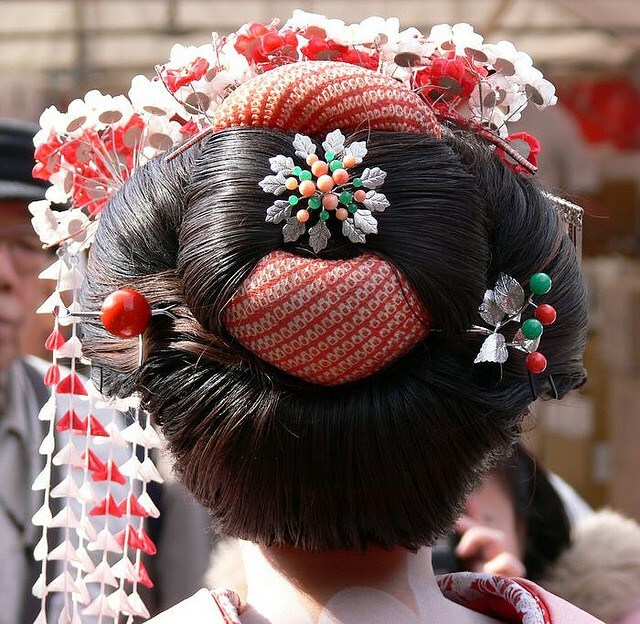 In one of the stores, there were traditional hair ornaments for sale that were similar to the ones worn by Geishas. I thought it would make a fantastic souvenir and one that I could actually incorporate into my daily look. Picking up the one I liked the best, I placed it into my up-do to see how it would look. Deciding that it wasn't actually for me in the end, I went to take it out and realized that it was stuck. As I looked in the mirror, it became apparent that the hair piece was intertwined in my hair, completely entangled. I pulled on it, ended up breaking off the comb within my bun and eventually just paid for it. I spent the next hour alone in my hotel room cutting it out of my hair! The stories go on and on as I have dealt with numerous hair fiascos while traveling. I'm not willing to give up traveling or give up on my hair so I have committed to embracing each new hair adventure that may come my way. How about you? Have you had any hair adventures while traveling?